We’re in Hippo Book Notes! Hike on over to Girls Inc in Concord on March 6! And that’s not all! We’ll be heading to Nashua today to interview for a Nashua Telegraph story, and appearances in the Union Leader are not far behind! Finally, stay tuned for some exciting announcements regarding some pre-release events. 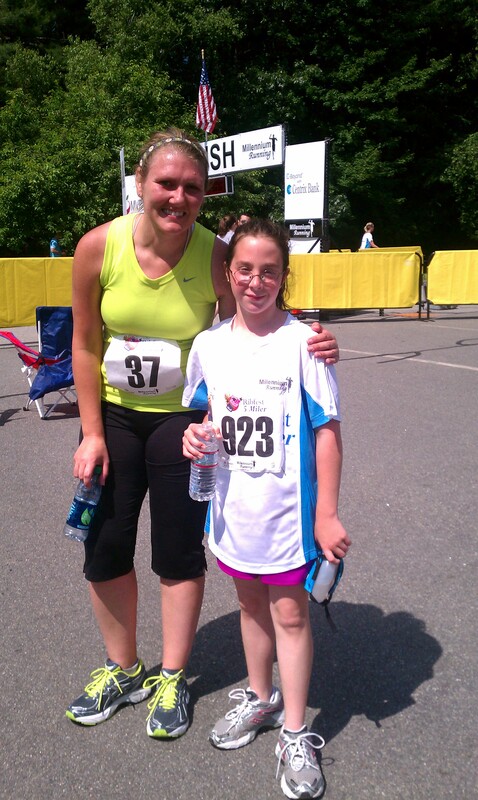 Teresa and Janelle at last summer’s Rib Fest 5 Miler. Friends, we wanted to share this amazing and kind column by Teresa Robinson of The Union Leader with you all. It will appear in print in Sunday’s (2/24/13) paper. Teresa was Janelle’s coach at the Girls On The Run program and the two of them formed a special (as you will read) bond. Teresa is a runner herself and has been an important inspiration to Janelle. We are so grateful and humbled by this, words cannot express. Our new adventure begins, and everyone is invited! Well, ours has been a long and wonderful journey, and now Janelle and I are ready to set off on a new adventure! 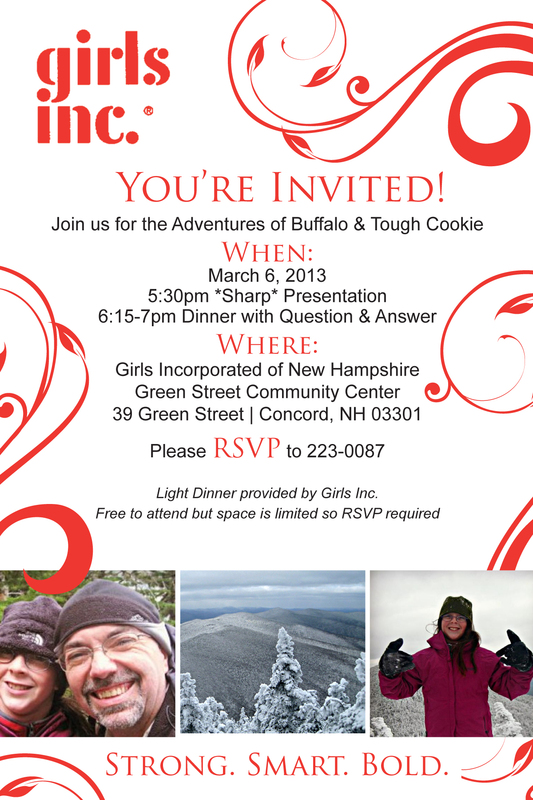 On March 6, we’ll kick off our pre-release book tour with a presentation and meet and greet at Girls Inc. in Concord, N.H. The event will be held at the Green Street Community Center, 39 Green Street. Kick off will be 5:30 sharp, and dinner will be 6:15. We’re thrilled to be on the road meeting our supporters and fans and all the folks who have helped make this quest possible. Click the official invite to the left for more info! This event is FREE and open to the public. There will even be a light dinner and snacks. We’ll have slides and you can check out some of the gear we used. The biggest draw, of course, will be to meet Janelle, the remarkable young lady who hiked 225 miles in 371 days, 52 mountains in 52 weeks. 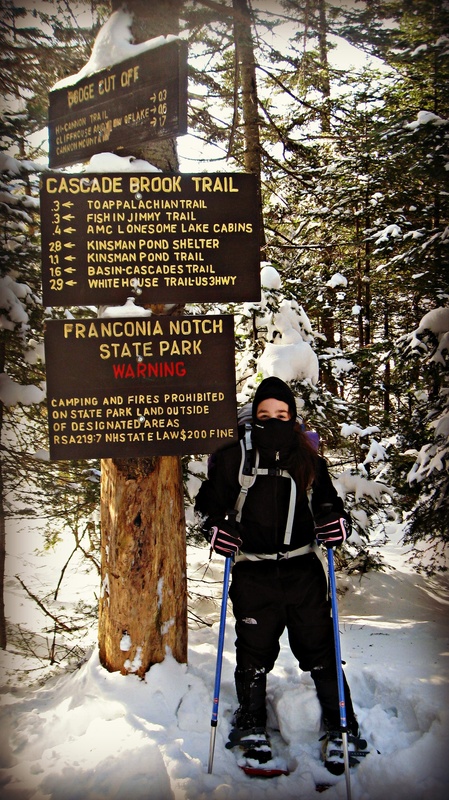 Janelle has kept up with her hiking, and she’ll talk about what’s next in our plans. We’re also on Twitter @danjszczesny. So why not Tweet about the event at #bandtc? This is just the beginning and we’re itching to get going. Won’t you join us? We’ll be live from the Banff Film Festival today! 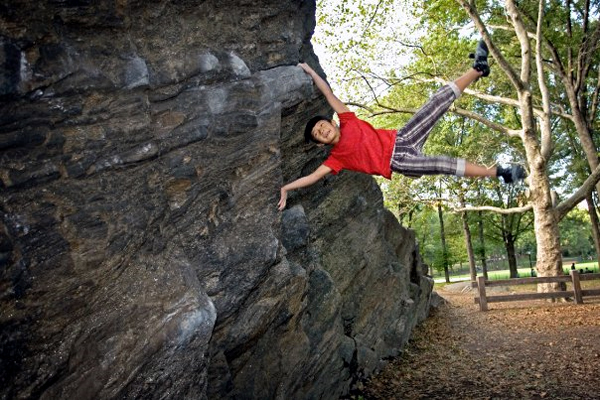 Last year’s Banff Film Festival featured a film on nine-year-old rock climbing wiz Ashima Shiraishi. Talk about girl power! We are going to give our new Twitter account a whirl tonight by going LIVE from the Banff Film Festival at the Music Hall in Portsmouth! This is exciting, but be gentle with us as we’re still learning how to us this social media tool. This annual Mountain Film event is a regular stop for Meena and myself, and a perfect way to get used to this whole Tweeting thing! We blogged about last year’s festival over at our EKPadventures site and it became the most popular post of the year. See you at The Music Hall! Janelle sits on the frozen pond, slowly scraping away the frosty snow until she reaches the ice. 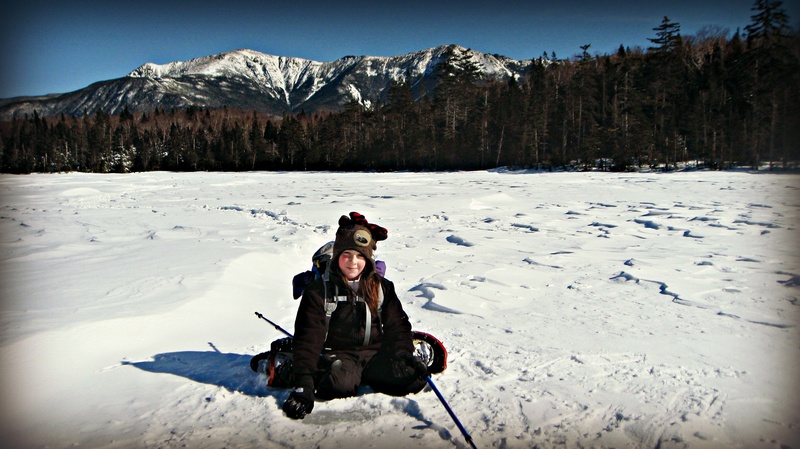 We’re having a bluebird day on Lonesome Lake, surrounded by mountains; the Kinsmen to our west and the Franconia Ridge towering above the trees to the east. The huge hump of the Cannonball rises like a camel’s back to the north, the mountain’s ledges pour ice down toward the lake. A scorching wind whips over the lake in relentless bursts, picking up the fine snow-ice and flinging it in tight swirls over the hard surface, like a white desert wind storm. But the girl does not care. She’s bundled tight and turns her back to the wind. 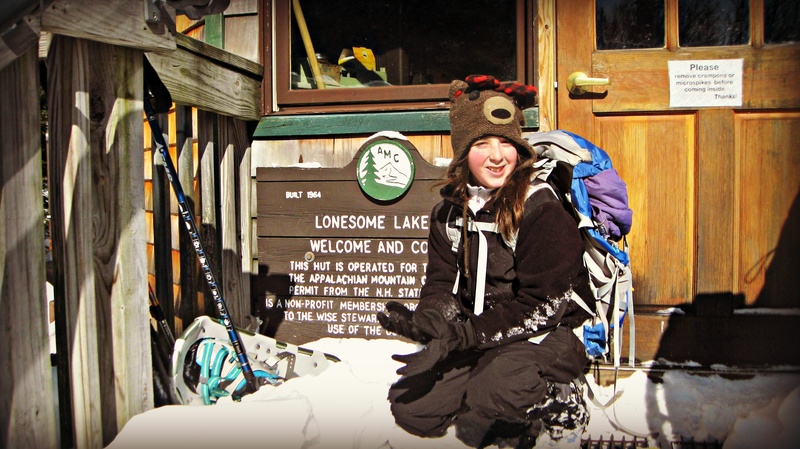 This hike to the lake and then to Lonesome Lake Hut has been a long time in the making. 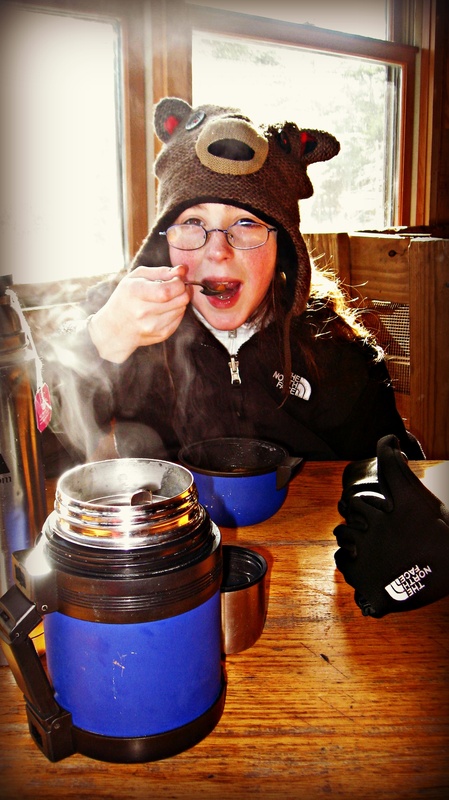 It’s her first time to an AMC Hut, and her first time walking over a frozen lake, both experiences she has begged for and looked forward to. And now, the day after a major storm, the mountain Gods have given us a perfect morning. It’s cold, but not frigid. Small wispy clouds lend the lake basin a true mountain feel. And the trail up to Lonesome Lake is well broken out and mellow. Tough Cookie’s first AMC Hut! I’m not sure what she’s doing, but there’s no need for us to hurry. So I just lift my collar against the wind and sit down next to her, there in the middle of a lake, and enjoy the day. She brushes off all the snow and creates a one foot or so circle of pure milky blue ice. Then she lower her eye to the ice, a couple of inches above the surface. Later, after she has fully explored the hut, she casts her verdict on these new surroundings. We sit together at the table, sipping tea and soup, devouring cheese slices and granola. The warm sun streams through the big windows, and I watch Janelle watch the hut master, an energetic young woman with a ski hat and large, blue sunglasses. 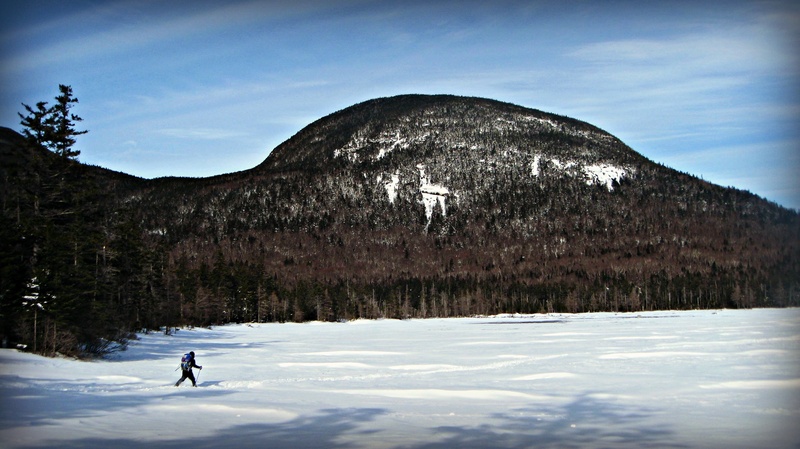 Playing on the ice, Franconia Ridge stands sentinel behind. 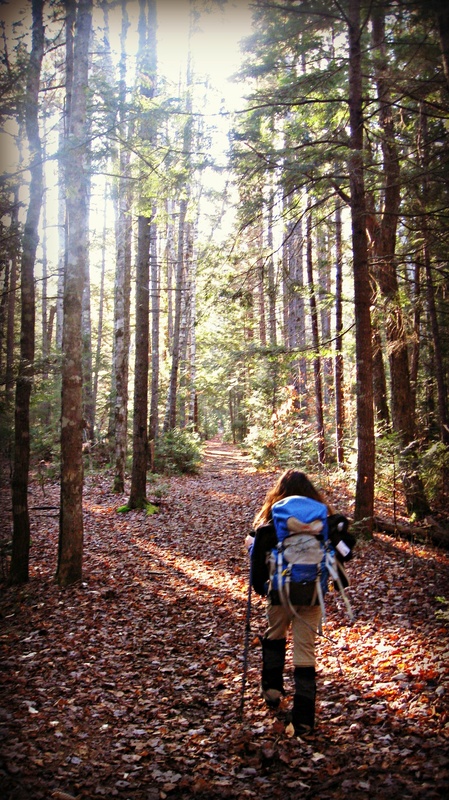 If you go: We took the standard route to the hut, The Lonesome Lake Trail. It begins on the west side of the I-93, but can be reached from the east side as well but walking through a tunnel under the highway. The trail is packed down and wide, a superhighway of a snow trail. It’s also moderate and beautiful. 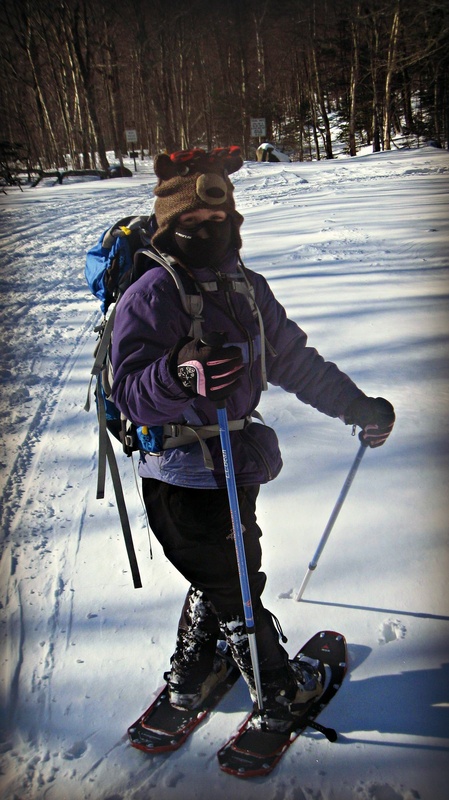 Micro-spikes or Stabilicers will get you there, but wear snowshoes to prevent post-holes. Our mileage: About 3.4 miles, give or take a few tenth as we hiked over the lake instead of around. The hut is open year round, on a self-service basis in the winter.